German TV network accused of Islamophobia for producing mock-up image of “Muslim Merkel”, as Pegida shows resurgence with 9,000-strong rally. The ARD network in Germany presented the German leader as a religious Muslim. An image of Angela Merkel wearing a traditional Iranian Islamic headscarf has caused controversy in Germany. 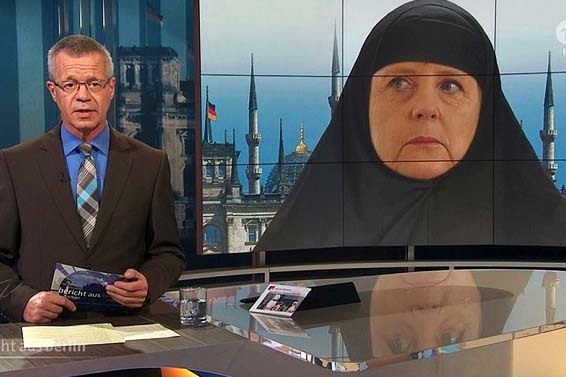 ARD television was inundated with complaints after it broadcast a mocked-up picture of Mrs Merkel wearing the garment, known as a chador, against a backdrop of the Reichstag surrounded by minarets. ARD is Germany’s second largest TV-network with more than 20.000 employes. The channel have 12,5 per cent of the total viewers. At least 10 million germans watch their newscasts. That the supreme leader of Germany, Angela Merkel, is presented in a burka is astonishing. It is a proof of Germany still being a free and democratic nation, where the political establishment do not fully control the national media. The Germans at large will laugh when they see this manipulated image of their leader. They will not call the cops, and demand legal actions against the journalists. But Muslims think and feel differently. They demand action. They are insulted that an infidel like Merkel is promoted as a religious sister of Muhammad. The German TV network has committed a crime, and insulted the “prophet”. Behold: The Islamic mass-immigration will soon force European politicians to cover their head, as they face Muslim opposition. The way to “peace” in Europe will be through a surrender to the demands of the sons of Muhammad. Or else, Hell will break loose. Just like in Nigeria, Iraq and Syria. May Jesus the Messiah have mercy on Angela Merkel, and all who follow the demands of the false prophet Muhammad. May they all accept Jesus as God and Lord. Yes, amen dear ivar. The culturally brainwashed mind of the Muslim is wired a totally different way than the normal mind, including being inhabited by a rabid set of demons bent on killing and subjection. Merkel hat entweder den Verstand (sofern vorhanden) verloren, oder sie kassiert einen Haufen Geld von jemandem. Kein normaler Mench und deffinitiv keine Frau wuerde das freiwillig machen. Merkel raus, aus dem Amt, Pseudo-Asylanten raus, aus Deutschland!!! The fear of Islam is not irrational. Hence, the term “Islamophobia” is a misnomer.